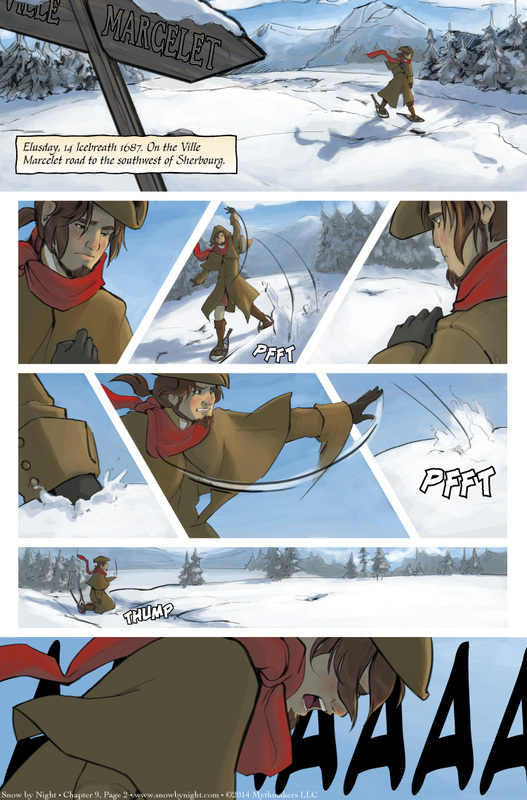 Blaise flees Sherbourg in Chapter 9 Page 2. The journey to Ville Marcelet is filled with disappointment and despair. To see a glimpse of the next page, please vote for Snow by Night on Top Web Comics. Next month will be a busy one for us. We have two — yes two! — conventions. And they’re big ones too. The first is Otakon on August 8-10, where we will have a brand new secret set of prints (Shhhh! They’re secret). Diane will be attending the convention with me. Julie will be oh so far way sitting across the aisle and well within paper airplane range. 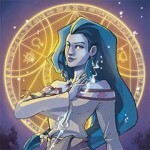 The next convention is GenCon on August 14-17. We’ll be in the Author’s Avenue. Diane is running off to be an NPC in the True Dungeon (She’s truant! Truant, I tell you!) so I’ll be joined by Québécois friend Éloïse. She may or may not be the inspiration for Mathilde. Either way, she’s threatening to come cosplaying as our favorite chanteuse, and you certainly don’t want to miss that. The following week, I’m going to collapse and catch up on sleep. *EDIT* Diane wants me to mention that the RSS feed got “Borked” in the site upgrade. We’re working to de-Bork it (unBork it? ), but the Borking is being highly resistant to our anti-Borking technologies. Hopefully, the RSS feed will be fully Borkfree soon. I’ll let you know. ;_; This is gonna be one hard road ahead. That “AAAA” in the last panel? That, my friends, is the sound of heartbreak. Now the interesting question is, is Snow-by-Night not showing up because she doesn’t want to, or because she can’t? I love this comic! Cool art change. Both art styles are amazing. I’ll await the update with bated breath. Aw, thank you so much. We’re making the pages as fast as we can! So much goodness coming your way. Glad to see you back. Hope the work gives you some solace. I’m a storyteller by nature. I’ll almost certainly find my solace in writing. That and planting rose bushes. We received a lot of pink rose bushes from friends and family.